Amish in Florida? Citrus trees and Amish people may seem an odd mix. But Plain people have had a continuous presence on Florida’s Gulf Coast since the 1920s. The Pinecraft neighborhood of Sarasota is home to an unusual Amish and Mennonite community. The Pinecraft neighborhood–the “village” is a grid of streets packed with modest dwellings. The residents–about the Amish and Plain Mennonites who live in Pinecraft. What makes Pinecraft unique?–two aspects of Pinecraft life you won’t find in any other Amish community. 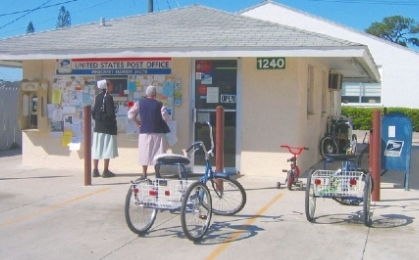 The Amish post office–an unusual institution. Getting there–how do Amish from traditional communities travel a thousand miles south? Sarasota activities–the beach, shuffleboard and other ways Amish have fun in the sun. Florida Amish origins–when did Amish first arrive in Sarasota? Sarasota is a city of over 50,000 people lying on the Gulf of Mexico. The Pinecraft village is just a small segment of this city, comprised of a couple dozen roads lying on a parcel of land about a half-square mile in area. Pinecraft was originally laid out as a tourist camp, and gradually developed into a full-fledged residential neighborhood along with an adjacent camp known as Homecroft (The History of Pinecraft 1925-1960, Noah Gingerich, p. 1). The community itself sits on the edge of city limits, but is essentially a part of Sarasota, making Pinecraft residents America’s only truly “city” Amish. In a sense, they’re also “beachy” Amish as well, with a number of shores lying a short bus ride or longer bike ride from the community. Amish who live and visit Pinecraft hail from a wide variety of places, and make up one of the most atypical Amish communities in the country. The main thoroughfare of the Pinecraft neighborhood is known as Bahia Vista St., a four-lane road bisecting the community and serving as one of Sarasota’s main east-west arteries. Amish at Pinecraft live in bungalows and trailers packed into the gridlike streets bearing traditional Amish and Mennonite names such as Yoder, Graber and Schrock. The residences are typically rented by the night, for short-term visitors, or for longer spells. 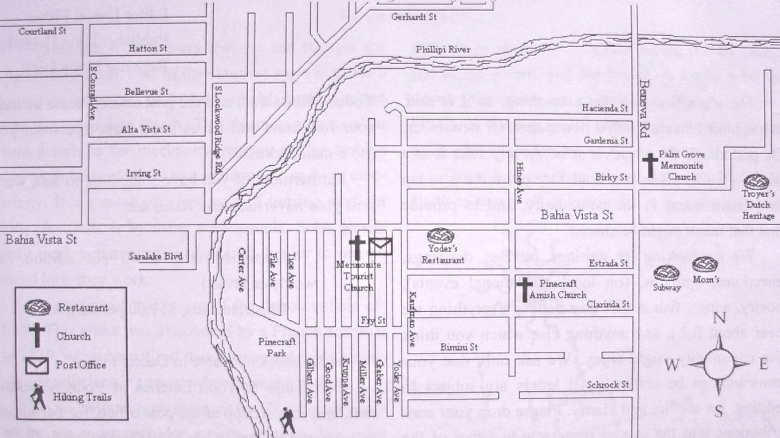 A map of the Pinecraft neighborhood of Sarasota, featured in the Pinecraft Pauper newspaper. The Pinecraft neighborhood is bounded on two sides by a historically flood-prone waterway known as Phillippi Creek. Pinecraft Park is a popular place for relaxation and a hotspot for birdwatchers (“Fifteen Nature Hotspots in the Sarasota Area”, Daniel Fisher and Captain Ahab, The Pinecraft Pauper vol. 2 ed. 2, Dec 29, 2010). Unlike in the vast majority of other communities, Amish here hold church in a freestanding building–the Pinecraft Amish Church. The Mennonite Tourist Church is a long-established place of worship occupying a former bakery building. The Palm Grove Mennonite Church can be found on Beneva Road, a main avenue intersecting Bahia Vista. The Pinecraft Amish community is unique in a number of ways. One reason is the mix of people in this community. Pinecraft is made up of a wide variety of Amish with roots in different settlements. This fact becomes obvious in the different styles of clothing worn by Pinecraft Amish. The settlement is popular with a range of Amish demographic groups as well. Amish retirees and older folks appreciate the sunny climate. Vacationers from the Midwest make regular visits. Some Amish newlyweds on honeymoon consider Pinecraft the ideal destination. Amish youth come here for seasonal work. There is also a significant Beachy Amish and Mennonite presence. True to Raber’s comment, Amish from the larger and more business-oriented communities in Ohio, Indiana, and Pennsylvania make up a large proportion of Pinecraft’s plain population. Part of the problem some Amish have with Florida is the lifestyle led by Amish residents and visitors to Pinecraft. Homes here come equipped with electricity. Amish generally permit electricity usage in such cases when living quarters are meant to be temporary. For instance, when staying in a hotel, Amish have no qualms about using the available facilities, though the TV might stay off. Of course, not all Amish approve of the wired-up side of Pinecraft life. As one New Order Amish bishop admits, “It’s a unique situation”, while at the same time noting that–at least in his church–“it’s nothing that’s forbidden. People don’t have to come and ask, May I go to Florida?’ We expect them to be loyal to their faith” (“Amish go to Vacation in Florida”). Another interesting aspect of the Pinecraft community is the type of transportation used. Amish at Pinecraft do not use horses and carriages. In fact, as one Pinecraft native notes, “The only buggy in town sits in the courtyard at Yoder’s Restaurant, mostly for photo opportunities” (see “Taste of Pinecraft: Sherry Gore interview“, Amish America blog). Only buggy in town. 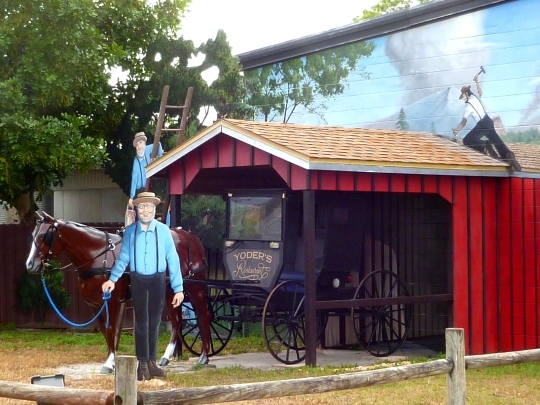 Outside Yoder’s Amish restaurant, Sarasota, Florida. In lieu of horse-drawn travel the Amish at Pinecraft mainly use large adult tricycles as well as bicycles, with some golf carts included in the mix. No other Amish community makes use of such a creative assortment of transportation, as the horse-and-buggy is generally considered an inseparable aspect of Amish life. However, given the urban setting of the Pinecraft community–and the transient nature of the community–bikes, carts and trikes make a certain sense. Another Pinecraft peculiarity: the world’s only Amish-operated post office. When the USPS decided to close their Pinecraft outpost, Amish offered to purchase the small, squat building. Postal service is particularly important for Amish, with the number of letters written and received by Plain people surely outpacing that of the average American. The Pinecraft post office also serves another important function. The building’s east wall is adorned with a bulletin board that serves as a plain Craigslist of sorts. Job postings, benefit events, and other business and general communications gets passed around the community thanks to the bulletin board. Amish, of course, do not drive. Due to the popularity of the destination, a number of coach companies have started up business serving the Pinecraft community. The first such line was created by entrepreneur David Swartzentruber, of Pioneer Trails. This coach leaves from the Geauga County, Ohio Amish settlement, with stops in Holmes County and other Ohio locations. Due to the popularity of Florida among Amish, other lines have been started, with regular coaches ferrying Plain passengers from Indiana and Pennsylvania back-and-forth over the Pinecraft circuit. Today, at least three lines make regular trips from traditional Amish destinations to Florida. “I would say we haul between 4,000 and 4,500 people in the wintertime,” noted Swartzentruber, adding that “It’d be about 75 percent Amish and the rest Mennonite, or English” (“Amish go to Vacation in Florida”). Passengers pay in the range of $250 for a round-trip ticket, with discount rates for children and seniors. Depending on where you get on, the Florida-bound passenger travels in the range of 15-18 hours to make the trip, returning–in most cases tanned and well-rested–on buses operated by the same companies. Bus lines run primarily in the Pinecraft tourist season, from about November to April. 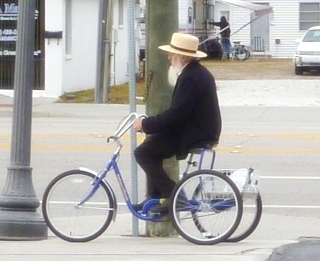 The name of the game for most Amish visitors to Florida is relaxation. 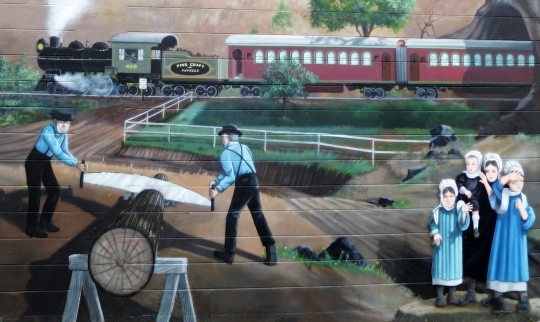 The Pinecraft community features many attractions to help Amish and others pass the time. Shuffleboard is a popular game in the Pinecraft Amish community. Hearty meals can be had at a range of restaurants. Concerts are performed by musical acts such as Gospel groups or Ohio native John Schmid. The annual Florida Haiti Auction, held in January, is one of a number of such events taking place in Amish communities around the country. A section on Pinecraft activities would be incomplete without mentioning the area’s beautiful beaches, which attract many Amish and Plain visitors. The shores of Siesta Key and Lido Key, two small islands lying just off Sarasota, are highly popular among Amish sun-seekers. Plain beachcombers scour these shores for sand dollars and shells. Making sand castles with children or just sitting and relaxing in the ocean breeze are popular, as is fishing. And what about sunbathing? Do Amish go swimming? While you probably won’t see many Amish women in bikinis, some men are known to wear swimming trunks. For those that can’t get past the breach of modesty, they may take to the seas in full plain attire. For the more adventurous, other activities may tempt. One Amish couple took to the skies–literally–on a parasailing trip. Ohio natives Gerold and Becky Miller signed up for the excursion seeking a spot of adventure. It was an experience described by Becky as “awesome”. Gerold apparently enjoyed the trip as well. “Know what I did up there?” asked the Amishman. “I kissed her” (“Amish go to Vacation in Florida”). For those more inclined to keep their feet on the ground, a local publication catering to the Amish and Plain contingent provides much enjoyment. The Pinecraft Pauper is a newspaper produced twice a month during the tourist season. The Pauper features local interest stories, resident profiles, recreational tips for visitors, photos, cartoons, and a heavy dose of humor. Read more on the Pinecraft Pauper. In the immediate vicinity of Pinecraft, there are at least four Amish/PA Dutch-style restaurants, meaning that per capita, Pennsylvania Dutch and Amish-style cooking is well-represented in Sarasota. The PA Dutch style restaurants are popular among English–both natives of Sarasota and tourists–as well as Pinecraft’s Plain population. Eateries such as Troyer’s Dutch Heritage and Yoder’s Amish Village serve as a meeting point for Amish from different communities. Troyer’s, for example, has been described as “a popular early morning hangout for Amish men with nothing but time on their hands.” Describing the dynamic, one observer wrote: “The suspendered and sunburned snowbirds arrange themselves in casual geographic groupings. Holmes County, Ohio, over here. Elkhart County, Indiana, over there. Lancaster County, Pennsylvania, in the booths along the far wall” (“Amish go to Vacation in Florida”). Local restaurants are a place for Amish and Mennonites to kill time and chew the fat while sipping a cup of coffee or filling up on stick-to-your-ribs PA Dutch dishes. Dutch favorites such as fried mush, butter noodles, meatloaf, fried okra, and shoofly pie populate the menus of these cheery locales. Diners are certain not to leave hungry. Troyer’s–Troyer’s Dutch Heritage Restaurant is a Pinecraft institution featuring a buffet, bakery, and banquet hall. Troyer’s is located at 3713 Bahia Vista St., Sarasota. Regular hours are 6 a.m.-8 p.m. Mon-Thurs, 6 a.m.-9 p.m. Fri-Sat, closed Sunday. 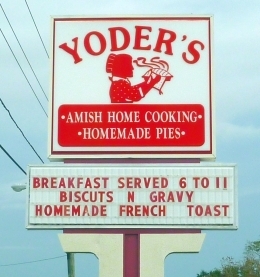 Yoder’s–Just down the street from Troyer’s, Yoder’s is another popular locale featuring hearty Amish-style cooking. The Yoder’s restaurant is part of a complex known as “Yoder’s Amish Village”, housing a produce market, “Fresh market” with deli meats and cheeses, and a gift shop. Yoder’s address is 3434 Bahia Vista St., Sarasota. Business hours are from 6 a.m.-8 p.m. Mon-Sat, closed Sundays. Mom’s/Dutch Haus–the Dutch Haus Family Restaurant, also known as Mom’s Amish Country Cooking, is found at 1247 Beneva Road, Sarasota. Sugar and Spice–Sugar and Spice, which features “Amish-style” cooking, is actually located a bit outside the Pinecraft neighborhood, at 4000 Cattlemen Road, Sarasota. Hours are 7 a.m. to 9 p.m. Mon-Sat, closed Sundays. How did the Amish find themselves in Florida? Pinecraft was founded as a camping area and originally bore the name Sarasota National Tourist Camp. The area was first settled by Amishman Daniel Kurtz in the mid-to-late 1920s. Kurtz purchased land and ended up farming celery, which was a well-suited crop for the area’s drained muck land. Other Plain people followed, and also became involved in produce growing (The History of Pinecraft 1925-1960; pp. 27-42) . Pinecraft gradually became popular for sun-seeking northern Plain people. Church records for the 1939-40 Winter season list Amish visitors from Indiana, Illinois, Iowa, Michigan, Maryland, Oklahoma, Ohio, Pennsylvania, and Virginia, along with members of Mennonite and other faiths (The History of Pinecraft 1925-1960; pp. 147-150). As time passed homes began to be built, with campsites becoming permanent freestanding residences and the area developing into a full-fledged suburban neighborhood. The Pinecraft Amish are a unique community for a number of reasons. These include the community’s transient nature, with the majority of residents being seasonal visitors. The use of electricity, as well as alternative transportation rather than buggies, also makes this group stand out. Holding church services in a free-standing building rather than in a home–a practice that evolved at least in part due to space constraints in the small Pinecraft residences–is another deviation from the Amish norm. For the Amish, Pinecraft is more a vacation destination than anything else. However, the settlement does have a number of year-round residents, particularly older retirees. Their presence through the hot summer months–while their northern brethren are busy farming, running businesses, and enjoying warm weather in their home communities–means Florida maintains a permanent year-round Amish population, though one that shrinks and grows with the coming and going of the tourist season. The History of Pinecraft 1925-1960: A Historical Album of the Amish and Mennonites in Pinecraft, Florida; Noah Gingerich. “Amish go to Vacation in Florida”, The Cleveland Plain Dealer Sunday Magazine, Christopher Evans, March 14, 2004. The Pinecraft Pauper, local plain newspaper published bi-weekly in-season. Amish America: An interview with Sherry Gore, editor of the Pinecraft Pauper. Florida Amish Furniture business directory. Maybe you could link to Katie Troyer’s blog on Pinecraft. Katie is a gifted photographer who documents life in the Pinecraft community. I spent 2 months in Bradenton, Fl which is next to Sarasota last winter. We took several rides through Pinecraft. We visited Troyers, their pies are great, and a quilt store. We saw softball and volleyball being played at the park. You see all kinds of plain dress and loads of bikes. It is a surprise to anyone who happens upon it. My husband and I are very familiar with Amish as we lived near Lancaster, Pennsylvania before moving to Florida and we attended their big auctions where they sell everything including beautiful quilts they make. As we drove closer to Pinecraft in Sarasota we saw Amish and we stopped at Yoders. It brought back sweet memories of home. Magdalena you are right Katie takes great photos, she has a gift for it. I think I am linked up to her on one or two of the other Pinecraft posts. I know she lost her blog for awhile and got a new one so I will make sure. Susan, sounds like you were there at the right time! I am a mother of four boys and have been learning to live a simple life. With this we discovered that the amish live like my husband and I would love to live, and teach our kids that there is more in life than a tv, and video games. My question is to you is that is there a way we can visit the amish community for a day and learn there way of living, so we can educate our children? And just learn more about other ways to live simple. I have just moved to Pinecraft and I would like to vist the Tourist church but I don’t know who I need to contact about it or if they even welcome visits from “outsiders”. I don’t want to just show up but I really want to start visiting because I am seriously interested in seeing if I could join sometime in the future. Thanks! I would like to know if outsiders are welcome to come and visit & if interested to join the community? If so, what are the requirements of joining? Elder Donald E. Martin, Sr.
Central Florida Amish meeting houses? Are there any Amish meeting houses of worship in North Central Florida? Near Ocala, Leesburg, Gainesville ?? I am an Old Baptist (Primitive) minister and have Ana-Baptist historical roots as the Amish……….I am interested in corresponding with some Amish folks which may have e-mail capabilities…. The closest churches I know are not Amish, but similar. In Zephyrhills, FL, is a Beachy Amish church. In Lake Butler, FL, is a Bethel Fellowship church. IS IT EXPENSIVE TO RENT A HOUSE FOR THE WINTER? During this economic crisis of which we find ourselves in, the Real Estate market whether buying or renting has greatly dropped. Therefore, it is likely to rent a place for the winter months much cheaper now than a few years back…..I am about 30 miles South of Ocala , Florida at a large Lake community which has many mobile homes for rent very reasonable ($350-$600 monthly) and lot’s of Bluegill, Brim and Bass to catch as well. Would be a fine place for our Amish and Mennonite brethren and families to migrate for the winter months…..
My health is poor this winter and we are honking about coming to FL. Most rental properties are classy and pricey. We want a simple cottage or trailer like is available in Pinecraft. But we have no idea who to contact. Do you have contact phone numbers? We are a plain couple with two olde teen agers. Rachel, if you have access to THE BUDGET, sometimes the Classified Ads list a place for rent. My name is Don Aldinger and I am a member of the West Swamp Mennonite Church here in Quakertown, Pennsylvania. I am looking to RENT a room/one bedroom apartment in the Sarasota/Bradenton area from March 1 to March 31, 2014. While in Sarasota, I would like to continue my study of the Mennonite and Amish communities. I have visited the hometown of Jakob Ammon in Switzerland and have visited the Wittenburg church in Germany where Martin Luther nailed his 90 thesis on the church door in 1517. I am a retired 65 year-old retired high school history teacher who will be visiting Florida for the first time. I am very dependable, honest, and trustworthy with a credit score of 834 (out of a possible perfect 850). Should you know of a room for RENT in March of 2014, please e-mail me at…donnie7@comcast.net OR telephone me at 267-373-9875. THANK YOU mit Gruessen!! Please let us know if there are any small places to rent for a non-Amish/Mennonite couple that want to spend more time near Pinecraft, FL. We would appreciate your reply. My life is collapsing around me. I have been an I.T. tech specialist for years. I was a chef, one of 8 voted best in CT. I have lost my way in life. I am tired of the demands that are needed to just live a good life. I need guidance. Can you help? I would sell everything I own for help. I have a strong back and skills, plus a cat. She’s been with me 18 years. Hi Bob, I sent you an email a few days ago. I’m not exactly sure what you are seeking here, but regarding getting help, please see what I wrote you in the email. We are working very hard to get our ranch ready to have a summer camp. The ponies are coming in 10 days. The fences have all been repaired and are ready. My wife and I have worked feverishly to get the repairs done to this place but we are tired and running out of funds. We need help with the roof and carpentry work. The less fortunate, disabled and blind children are coming and God is going to bless them so very much. Please pray and see if you can assist us. Thank you for your kind hearts and generous spirits. Lived in Ohio several years & came to admire Amish, furnitures, food among others. Now I’m residing in Fort Walton Beach Fl. Furnishing & looking for Amish furnitures locally … Anybody in the area or nearby places carry Amish made furnitures? Amish furniture Pensacola/ Ft. Walton/ Panama City? I had no idea there was such a large group of Amish in Florida- mainly I thought they were in the New England area, but you learn new things everyday! I’ve always found their culture so interesting and it is something I have always wanted to study more about. 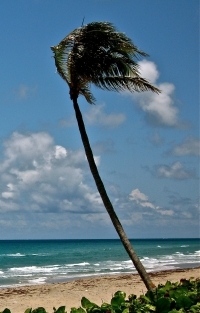 Florida is a great place to travel and even live depending on the area. I’ve always loved Palm Bay and the Palm Bay Hotel (www.palmbay-hotel.com) is affordable for all and the hotel is accommodating for all! Widow for 12 years, everyone comes with their hand out but when you have finally reached the point of needing a hand up, everyone scatters to the wind. For over 2 years I have been working to get myself back to the simple life only to find out I have been a victim of an unethical mortgage lender & now they are attempting to take my home that I put on the market to downsize & lead that simple life I love so much. These 12 years have been filled with tragedy & heartbreak but no one will ever take my faith, hope, love & compassion. I am looking for Amish built small homes that can be placed in my sister’s backyard but the only sites I have found are in Pennsylvania or Virginia. Are there any Amish made small homes or builders near Panama City, FL? I need to break these binders that exacerbate my disability, I need to be productive again. I live in the Daytona Beach area and am striving to get back to a simple, community oriented way of living. I would like to meet some like minded people in the area and/or find a Pinecraft friend to communicate with via e-mail or snail mail. Moved to Florida 7 weeks ago from Ohio. We really enjoyed going to the Amish Store for meats, cheese balls, sugar free candies, cheese and the wheat square crackers. Is there such a store near Spring Hill, Florida??? There is a store in Largo – just south of Clear Water. They carry a lot of Amish products. It is a small store just south of downtown Largo right next to a large Hospital, but they do carry a good variety of things. It is half the distance for you than to Sarasota. I was just there on Saturday on the way to the Beach with the kids. There is a very good Amish store in Largo, which is in Pinellas Co. The store is South of Clearwater and North of St. Pete. It’s off Westbay Ave. at 206 13th St. In Largo. The Phone is 727-587-9657. Best to go to Pinecraft, FL and visit Yoder’s market and Detwiler’s Market..lots of stuff from Ohio, Pennsylvania and Indiana. There’s a great new golf shop in Pinecraft called Pinecraft Golf Shop. They do golf club rental for $15 a day or $65 a week. Also have a great selection of golf clubs, accessories and memorabilia. My parents met in Sarasota. Not in Pinecraft, mind you, but still Sarasota. This is yet another coincidence that marks my family’s life as we have nearly always — or my parents, grandparents, etc. — lived near large groups of various Amish denominations. I believe my dad, who once worked as a carpenter in that oppressive, tiring, Sarasota heat, told me he once worked alongside several Amish or Mennonite carpenters on the crews. “Good guys,” he told me. I was raised Texan/American and it ruined my life and destroyed my soul. At age 50 a “spirit” of Truth has been alight in me for years and I can no longer agree or covet as a Capitalist. 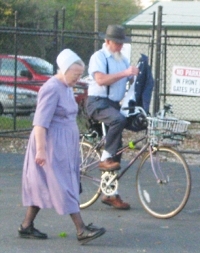 Though I disagree with some of the clothing and demands and reluctance of the Amish people to be EQUAL IN ALL ABILITIES as GOD’s people to others whom choose not to be, I desire to be accepted among them and offer the rest of this life’s efforts and labors to any community of souls that shall accept me and assist me in relocation unto their fold so that i may gain Peace in my Heart and Joy of a better human gathering than the abnormality of normal Americanism had offered to devour of my good. Whom among the Hemisphere West earth will be brotherly, sisterly, and make my time blossom in happiness among Good people I have yet not met in 50 years? I have never seen Florida, but have considered abandoning my pets and possessions to be homeless and vagrant under a bridge there do to the climate– and beach to bathe freely. I would like to go a Amish Town but a do not know where it is. Can somebody tell me the address?. I discovered my background on ancestry.com I have family all over Pennsylvania and most of them are Dutch and from Rotterdam/ Netherlands. I’ve eaten at Yoder’s a couple of times and shopped in the market, but I’ve never been in Pine Craft. I know some Amish people view non Amish people as “English cause we don’t do things like the Amish cause I’m not Amish of course…. I just wanna know if I were to visit if I look different and drive a car if I would still be welcomed to come visit. When I went to Yoder’s in Sarasota it was a mix of Amish/English. I would love to visit to find out more about my Dutch/ Netherland culture. I live in Europe, The Netherlands and have been travelling to Florida on multiple occasions. What I would like to know is if it is possible to visit the community as tourist. Can the restaurants be visited as tourist? Can I visit any store and be able to buy any cookbooks, with Amish recipes and learn more about the history and culture? Ruth, the Der Dutchman Restaurant is able to accommodate bus-load groups of people. Joe, in Florida, one place where scrapple may be purchased is at Detwiler’s Farm Market, 6000 Palmer Blvd., Sarasota, FL 34232. Phone 941-378-2727. Closed on Sunday. thankyou Linda was in Sarasota today and forgot that all the amish commuity business are closed on Sundays But will chheck it out. Once shin thankyou. Detwiler’s scrapple is fresh in the deli. They slice it the thickness you want. Der Dutchman also has scrapple, vacuum sealed. We purchased some last week when Detwiler’s sold out of their’s. I stumbled across your website while looking for a list of rental houses/apartments which may be available in the Pinecraft area. Do you know where I can find such a list? I’d like to take my family to Pinecraft later this month and am looking for a place to rent for a few weeks. Hi T, I checked with a local about your question, and was told that classified ads in the Budget newspaper is one source, and if you are in town, the Pinecraft bulletin board. However, depending on when you’re going, there is a lack of room in Pinecraft itself–apparently over Christmas, 3 busloads stayed on Siesta Key, while for the Haiti Benefit auction, 2 busloads stayed at the Best Western close to Bahia Vista and 41. Thank you, Eric. You are kind to go after that information. So far this year there are near record amounts of people coming down to the southern coasts of Florida. When the temperatures dip below zero and the snow is relentless in the northern US, more people look to escape it. If you can find lodging, be prepared to pay top dollar for it. Dear one’s, I am a Pastor among the Old School Primitive Baptist which meets on the first Sunday of the month at FELLOWSHIP Church’s meeting house located 10 miles East of I-75 on Hwy 674, Address 10232 HWY 674, Wimauma, Florida. We gather at 10:00 A.M. in preparation for divine worship. We sing strictly Acapella from a no note hymnal. We love the Old Paths and history of our Amish brethren where much of our heritage had it’s beginnings. All are welcome to come and visit us and dine with us following the worship meeting….We open our hearts in Christian love to any and all that love the old ways of simplicity in worship. I have a. 4 year old son with special needs. Amount or barter. I’m a hairstylist ..
Hi are there any vintage Amish made examples of these simple lodgings in pinecraft? I would love to see a photograph or even get my hands on a cabin or an Amish made replica, I have an extra lot in sarasota and would like to offer lodging to the good Amish people. I was wondering if there are any Amish stores that sell their food such as jams, pies extra? If not how can someone get a hold of an Amish person and possibly sell some of their items. We miss our Amish friends from Tennessee. They would make us pies and breads. The settlement is popular with a range of Amish demographic groups as well.Amish retirees and older folks appreciate the sunny climate. We are looking for Amish home builders in FL. We live in a small town near Gainesville, FL do you have any information you could guide us to? Thanks for your time. Denise, unfortunately you’re going to have a hard time of it. The only Amish in Florida are in Sarasota, and that is a very atypical community with few year-round residents (in fact most Amish who are in Florida are there to get away from work! 🙂 ). There aren’t many Amish within reasonable driving distance in other states either. If it was a huge project, or possibly if you could arrange something with an Amish crew to come and stay (youth and younger men in particular may be attracted to this; they sometimes do these kinds of jobs, and also go for weeks at a time for disaster relief), it might work. Amish from all over the United States come to Pinecraft for winter vacations. They will have church in a building here because most houses are small. There are some videos on UTUBE OF THE BIG BUS’S That bring the Amish to Pinecraft. I was wondering if I could get a small barn construction? Approximately the cost too ? Wondering if Hurricane Irma caused damage to Pinecraft, and hoping that it did not! Kathy I have been getting this question from readers, haven’t heard anything specific yet but I put in a question to someone local who would know. If and when I hear back I’ll let you know here. Here are some of the photos I took last evening as I biked around. I am not aware that Pinecraft lost its power. Plus no major damage. I did notice this morning that three mailboxes got hit on Graber Ave between Bahia Vista and Fry. The one sitting in a bucket of cement rolled over without damage. Carl & Gertie McClure got broken off and also one in that neighborhood is down on the ground. I am an Amish taxi driver who lives in Lancaster, PA. I bought a place in Ruskin Florida, and will be moving there in November 1917. Is there any need for my driving services this winter down that way. I am looking for an Amish builder who can build a horse barn (two stall with tack room) in Sarasota Florida.